Jain Center of Kansas City (KCJS), which is a part of the Hindu Temple and Cultural Centre of Kansas City, has been blessed with about 40+ Jain families. 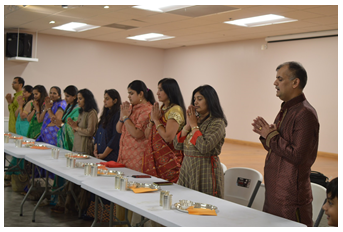 Kansas City Jain Sangh celebrated Mahavir Janma Kalyanak on 9th September. Center members participated in daily pratikaman, kids recited sutras during the daily pratikaman. This year KCJS has witnessed phenomenal Tapascharya in the sangh, which is a moment of pride for the sangh. Tapasvi’s from the community have exemplified a unique source of inspiration to the entire Sangh.